Industries Pvt. Ltd. shares a hand in all good things that you see in any contemporary architecture, from the awesome malls to the corporate structures. Industries Pvt Ltd is one of the leading ACP sheets manufacturers in India. The company has created a space in the aluminium composite panel industry. Industries Pvt Ltd is an ISO 9001-2008 certified company that was established in 2002. With consistent years of high-quality services, we continue the same grade of the products and colour codes. 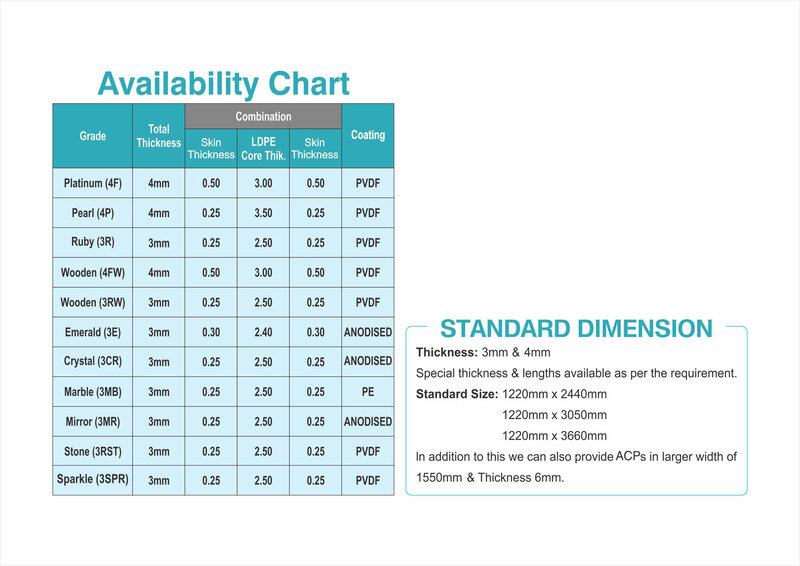 Why ACP Sheets From 4mann Industries Pvt. Ltd Are More Preferred? We are known to be among the top aluminium panel sheet manufacturers in India, and provide the premium types of Aluminium Composite Panels that are of flat types. These are manufactured from thin aluminium sheets bonded with a non-aluminium core. The exterior aluminium composite panels are used for partition or architectural cladding or false ceiling or machine coverage. With high durability and tensile strength, these sheets serve as the vital part of the construction. The best Aluminium Panel Sheet Dealers in India opt for our products because of their superb flatness, lightweight, easy workability, quality, and wide-ranging colour options. The Aluminium Panel Sheets manufactured at 4mann Industries Pvt. Ltd stands out with excellence in any test as defining standards. We provide a high quality of panels which have good insulation, low thermal conductivity and weather protection feature. With a preference for valuable customers, 4Mann Industries Pvt. Ltd provides a wide range of applications and multiple deployment advantages from which the customers can choose as per their needs, budgets and the construction requirements. Why And Where The ACP Sheets Can Be Used? 4mann Industries Pvt. Ltd takes a great and effective part in the construction of the shopping malls, movie halls, hotels, hospitals schools, restaurants, rail coaches, airports, advertising signages, residential and commercial complexes etc. The Aluminium Composite Panels enhance the looks of the structures and also protect them from the weather ravages. These Aluminium Composite Panels can be ideally used for the exteriors as well as the interior facades of the structures. For their high durability and effective features, the ACPs are regarded as the symbol of safety. The aluminum panel sheets can also be used for Wall Claddings, which serve as the best wind barrier for the structure. These protect the structural walls from dampening and extremely rough weather conditions. 4Mann Group has proved its excellence not only in the national boundaries but also at international level. The Group has provided its services of excellence for the reputed brands well established in India as well as across the borders. We manufacture and supply the top niche quality of Aluminium panel sheet in India and ensure our clients about the durability and safety features.